The elements in the sum are called terms; an is the nth or general term of the series. A series of the form is called a p-series. Show that the geometric series converges to 2. Show that the harmonic series diverges. Since that sum is not bounded, it follows that diverges to ∞. B2. Theorems About Convergence or Divergence of Infinite Series. The following theorems are important. THEOREM 2e. If the terms of a convergent series are regrouped, the new series converges. B3. Tests for Convergence of Infinite Series. NOTE: When working with series, it’s a good idea to start by checking the nth Term Test. If the terms don’t approach 0, the series cannot converge. This is often the quickest and easiest way to identify a divergent series. SOLUTION: Since the series diverges by the nth Term Test. A geometric series converges if and only if |r| < 1. Does 0.3 + 0.03 + 0.003 + · · · converge or diverge? NOTE: = 0.333 …, which is the given series. B4. Tests for Convergence of Nonnegative Series. The series is called a nonnegative series if an ≥ 0 for all n.
If f (x) is a continuous, positive, decreasing function and f (n) = an, then converges if and only if the improper integral converges. The improper integral and the infinite series both diverge. Test the series for convergence. by an application of L’Hôpital’s Rule. Thus converges. A p-series converges if p > 1, but diverges if p ≤ 1. Does the series converge or diverge? hence the series converges by the p-Series Test. We compare the general term of the nonnegative series we are investigating, with the general term of a series known to converge or diverge. (1) If converges and an un, then converges. (2) If diverges and an un, then diverges. Any known series can be used for comparison. Particularly useful are p-series, which converge if p > 1 but diverge if p 1, and geometric series, which converge if |r| < 1 but diverge if |r| 1. SOLUTION: Since and the p-series converges, converges by the Comparison Test. Remember in using the Comparison Test that you may either discard a finite number of terms or multiply each term by a nonzero constant without affecting the convergence of the series you are testing. If is finite and nonzero, then and both converge or both diverge. This test is useful when the direct comparisons required by the Comparison Test are difficult to establish. Note that, if the limit is zero or infinite, the test is inconclusive and some other approach must be used. Since also diverges by the Limit Comparison Test. Let if it exists. Then converges if L < 1 and diverges if L > 1. If L = 1, this test is inconclusive; apply one of the other tests. Therefore this series converges by the Ratio Test. (See §E2.) Since e > 1, diverges by the Ratio Test. But if p > 1 then converges, while if p 1 then diverges. This illustrates the failure of the Ratio Test to resolve the question of convergence when the limit of the ratio is 1. If L = 1 this test is inconclusive; try one of the other tests. Note that the decision rule for this test is the same as that for the Ratio Test. B5. Alternating Series and Absolute Convergence. is the alternating harmonic series. A series with mixed signs is said to converge absolutely (or to be absolutely convergent) if the series obtained by taking the absolute values of its terms converges; that is, converges absolutely if converges. When asked to determine whether an alternating series is absolutely convergent, conditionally convergent, or divergent, it is often advisable to first consider the series of absolute values. Check first for divergence, using the nth Term Test. If that test shows that the series may converge, investigate further, using the tests for nonnegative series. If you find that the series of absolute values converges, then the alternating series is absolutely convergent. If, however, you find that the series of absolute values diverges, then you’ll need to use the Alternating Series Test to see whether the series is conditionally convergent. Determine whether converges absolutely, converges conditionally, or diverges. SOLUTION: We see that not 0, so by the nth Term Test the series is divergent. SOLUTION: Note that, since the series passes the nth Term Test. But is the general term of a convergent p-series (p = 2), so by the Comparison Test the nonnegative series converges, and therefore the alternating series converges absolutely. SOLUTION: is a p-series with so the nonnegative series diverges. so the alternating series converges; hence is conditionally convergent. 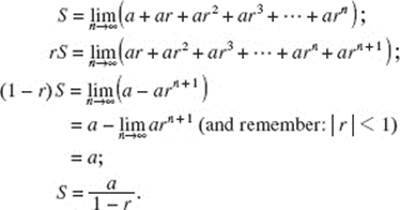 Evaluating the sum of the first n terms of an alternating series, given by yields an approximation of the limit, L. The error (the difference between the approximation and the true limit) is called the remainder after n terms and is denoted by Rn. When an alternating series is first shown to pass the Alternating Series Test, it’s easy to place an upper bound on this remainder. Because the terms alternate in sign and become progressively smaller in magnitude, an alternating series converges on its limit by oscillation, as shown in Figure N10–1. Because carrying out the approximation one more term would once more carry us beyond L, we see that the error is always less than that next term. Since |Rn | < an + 1, the error bound for an alternating series is the first term omitted or dropped. by less than which is the error bound. SOLUTION: Since the series converges by the Alternating Series Test; therefore after summing a number of terms the remainder (error) will be less than the first omitted term. We seek n such that Thus n must satisfy (n + 1)2 > 1000, or n > 30.623. Therefore 31 terms are needed for the desired accuracy.